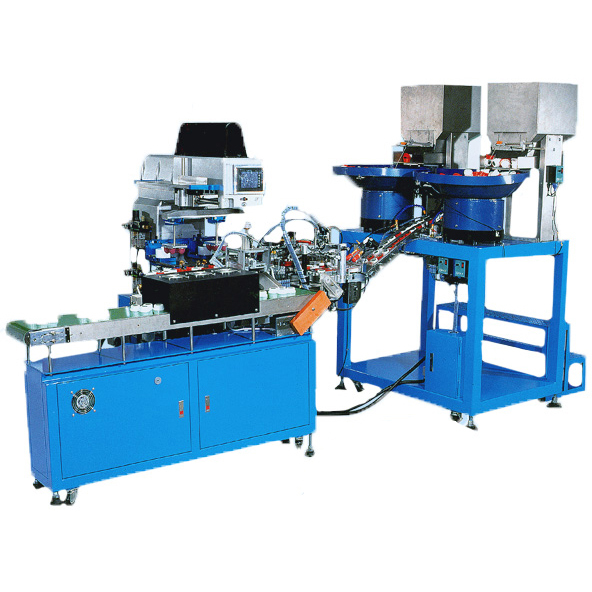 Auto Two Color Cap Printer(WE-9155) - Guger Industries Co., Ltd. Suitable for large caps 2 color printing. Custom-made machine is available and welcome. 2 color large cap printing, the output: 3,600 pcs/hr. Double vibration feeding unit with direction selection gives caps correct direction and stable feeding. The Anti-static & Dust free devices are used. Flame treatment can make the adhesion of ink better. 16 station rotating conveyor for precise registration. Germany sealed ink cup with steel plate is used. No scent, odorless, easy to clean. An optional hot or cool air drying equipment can be mounted on the unloading system. Human / computer interface control, easy to operate.